WASHINGTON (AP) — Army Sgt. 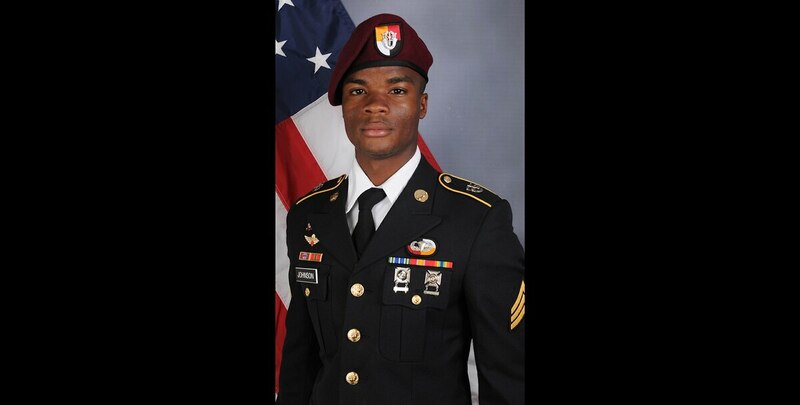 La David T. Johnson died in a hail of gunfire, hit as many as 18 times as he took cover in thick brush, fighting to the end after fleeing militants who had just killed three comrades in an October ambush in Niger, The Associated Press has learned. A military investigation has concluded that Johnson wasn’t captured alive or killed at close range, dispelling a swirl of rumors about how he died. The report has determined that Johnson, 25, of Miami Gardens, Florida, was killed by enemy rifle and machine gun fire from members of an Islamic State offshoot, according to U.S. officials familiar with the findings. The Oct. 4 ambush took place about 120 miles (200 kilometers) north of Niamey, the African nation’s capital. Johnson’s body was recovered two days later. Johnson was struck as many as 18 times from a distance by a volley of machine gun rounds, according to the U.S. officials, who said he was firing back as he and two Nigerien soldiers tried to escape. The bodies of three U.S. soldiers were located on the day of the attack, but not Johnson’s remains. The gap in time led to questions about whether Johnson was killed in the assault and not found, or if he was taken away by the enemy. On Monday, members of Johnson’s family said they still have many questions about the events. Johnson’s mother, Cowanda Jones-Johnson, told CNN that she first learned of the latest investigation results on Facebook. She also says the military hasn’t told her why her son’s remains weren’t found at the same time as the bodies of his comrades. “I want the truth ... but there’s no closure,” she said. The U.S. Africa Command began its investigation with a team headed by Army Maj. Gen. Roger Cloutier, the command’s chief of staff. The team visited locations in Niger to collect evidence and information about the attack, and will soon submit a draft of Cloutier’s report to Marine Gen. Thomas Waldhauser, head of Africa Command. Waldhauser could ask for additional information. The final report is expected to be released next month. Johnson’s combat death led to a political squabble between President Donald Trump and a Democratic congresswoman from Florida after Trump told Johnson’s pregnant widow in a phone call that her husband “knew what he signed up for.” Rep. Frederica Wilson, D-Fla., was riding with Johnson’s family to meet the body and heard the call on speakerphone. The spat grew to include Trump’s chief of staff, who called Wilson an “empty barrel” making noise.